We all want to be the best mom, even before our baby is born. With Similac® Mom helping to support the increased needs of pregnancy and breastfeeding, without excess calories¹ it is the best gift you can give to both you and your baby. Nutrients to help support a healthy immune system. Helps keep your digestive system healthy. Low in fat and calories with less than 1 g of fat and 126 calories per serving. Small meal size supports a diet of frequent healthy snacks to help alleviate nausea. The standard reconstitution is prepared by mixing 3 scoops (36.5 g) powder into 150 ml water for a final volume of 177 ml. 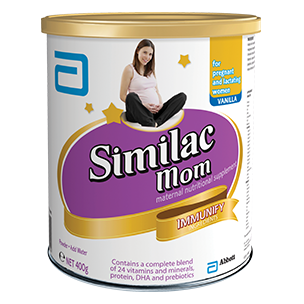 Similac® Mom Vanilla 400 g powder. Penn Medicine. Eat right during pregnancy, 2005. Available form http:wwwpenmedicine.org/health info/pregnancy/000215.htm. Accessed Jan 23,2012. Dietary supplement fact sheet:Calcium.http://ods.od.nih.gov/factsheet/calcium. Accessed Jan 23 2012. Innes SM. Perinatal biochemistry and physiology of long-chain polyunsaturated fatty acids. J Pediatr 2003;143:S1-S8. Lozoff B, Georgieff MK. Iron deficiency and brain development. Semin Pediatr Neurol 2006, 13(3): 158-165. Salgueiro MJ, Zubillaga MB, Lusionek AE, et al. The role of zinc in the growth and development of children. Nutrition 2002;18:510-519.